On September 25, 1789, the U.S. Congress passed 12 amendments to the Constitution of 1787 and only the first article, which capped Congressional Districts at 50,000 citizens, has failed ratification. Under the current 435 Member House the Electoral College Vote is Trump: 307 and Clinton: 228, which is 74% of the victor’s vote. Under an Article the First Apportionment Act the Electoral Vote is Trump: 3520 and Clinton: 2733, which is 77% of the victor’s vote. Article the First is an improvement on the popular vote being tied to the Electoral College but in the case of the 2016 election, President-elect Trump would have still won the election. Under an Article the First Apportionment Act, however, it would be relatively easy to change the course of the Electoral College to more closely follow the Presidential popular vote. 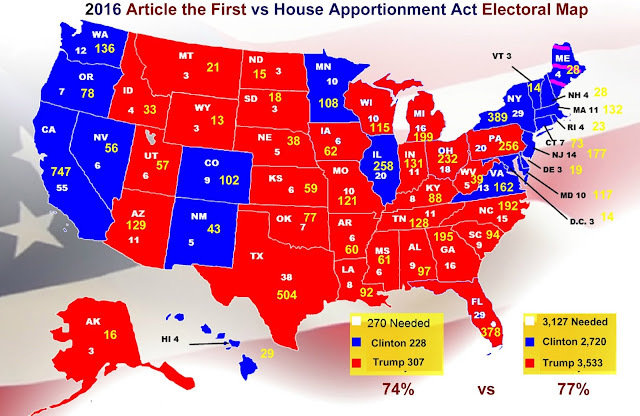 Once an Article the First Apportionment Act is passed, citizens in each State would be free to lobby their legislatures to enact a state law awarding Electoral College Votes by Congressional District, similar to Maine and Nebraska, as opposed to the current popular vote "winner takes all electors" now enacted in 48 States. In this case, both Vice President Gore and Secretary Clinton would have won the Electoral College vote in 2000 and 2016.